Time and again on our brief but extremely busy sojourn through Spain and France, members of IU’s delegation, led by President Michael McRobbie, were exposed to the extraordinary power of IU’s longstanding engagement in two of the most historically important, economically dynamic and culturally vibrant countries in all of Europe. Our trip, organized by IU’s Office of the Vice President for International Affairs, was highlighted by visits — first in marvelous Madrid and then in charming Aix-en-Provence, France — to two of IU’s longest and most successful study abroad efforts. In both cities we experienced, first-hand, the transformative and often life-changing impact that living and learning in a foreign country can have on our students. We also delved deep into the types of programs and partnerships that make possible overseas opportunities for IU students and faculty, produce research collaborations that address the most important issues facing our planet and prepare future generations of graduates to thrive in today’s increasingly international marketplace. 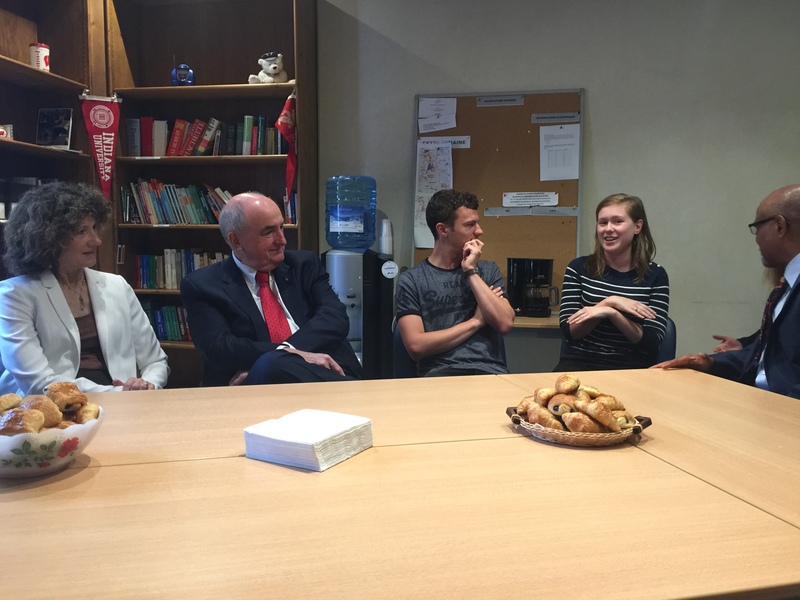 IU students in the Aix-en-Provence Program share their study abroad experiences with IU President Michael McRobbie and members of the IU delegation to France. Along the way, we shared with our hosts, longtime partners and potential collaborators major new developments at IU, such as the university’s ever-expanding global gateway network, including the new IU Europe Gateway, which is facilitating many of the student, faculty and staff activities, including academic conferences, workshops and other events, taking place across this region of the world. We also invited participation in IU’s bicentennial celebration, which will begin during the 2019-20 academic year. Meetings with officials, including Rector Carlos Andradas Heranz, IU’s newest recipient of the Thomas Hart Benton Medallion for exceptional international service, at the Complutense University of Madrid, perennial host site for IU’s Madrid Program. While there, Heranz, President McRobbie and their respective colleagues discussed expanding upon IU’s fruitful collaboration with UCM. They also toured the historic UCM campus and several buildings that, if they could speak, would tell enough incredible stories to fill up this blog site. 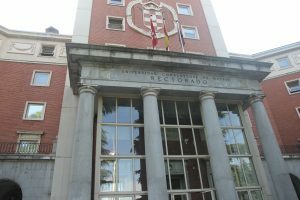 Those sites included the Facultad de Filosofía, where the Madrid Program offices were once located, and which served as headquarters for the legendary International Brigade during the bloody Spanish Civil War. An enlivening croissants-and-coffee chat with the current cohort of IU students who are concluding a year studying abroad in France as part of IU’s Aix-en-Provence Program. Through the more than half-century-old program, which IU has helped manage since 1997, IU’s students from a diverse range of majors immerse themselves in, among other areas, French language, civilization, culture and history, while also navigating the day-to-day challenges that come with living in a land where they’re forced to quickly adapt to a new language, culture and customs. 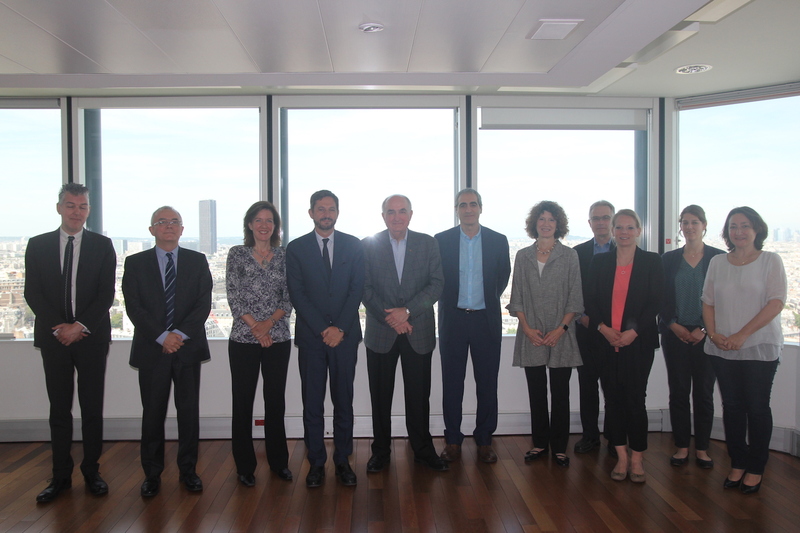 Meetings in Aix-en-Provence and in scenic Marseille with top administrators and faculty to explore new faculty and student exchanges with Aix-Marseille Université, the country’s largest university with around 70,000 students and one of the best universities in the region. Both IU and AMU share a strong commitment to greater global engagement overseas, as well as neatly aligned academic strengths in the arts, languages, humanities, social sciences, economics, management, medicine and more. While at AMU, McRobbie and IU Vice President for International Affairs David Zaret renewed an agreement between AMU and the School of Engineering and Technology at Indiana University-Purdue University Indianapolis that has facilitated student exchanges between the two schools since 2002. 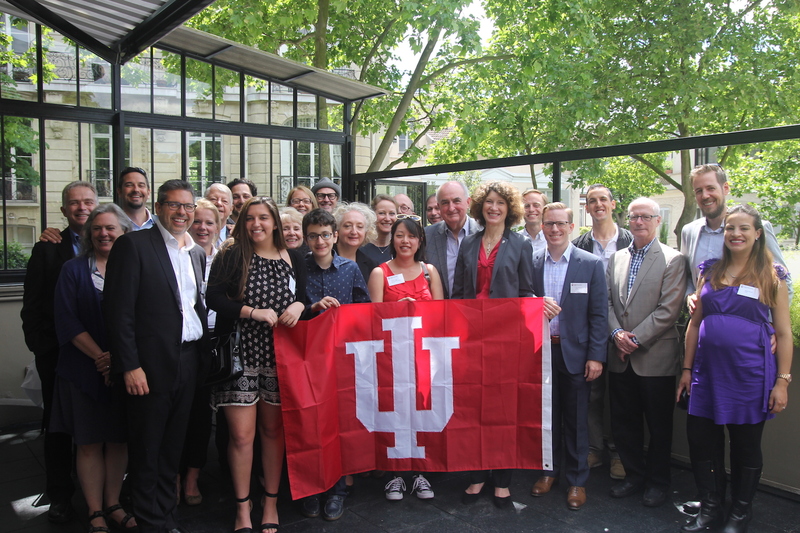 A gathering in Paris of IU’s European alumni, including the leaders of three separate alumni chapters on the continent, who, collectively, are a shining reflection of how alive and well l’esprit de IU is in France and all across Europe. Meetings at University Paris II Panthéon-Assas, France’s first and most prestigious law university, to explore ways to expand upon a fruitful relationship that, in recent years, has generated numerous exchanges of law students and faculty between the two universities. A dizzying tour of Paris’ legendary Louvre Museum — home to such masterworks as the “Mona Lisa,” “The Last Supper” and “Raft of the Medusa.” The tour helped to highlight a couple of interesting art and design links between IU and the Louvre and signaled the possibility of some future joint opportunities between the university, including its acclaimed Eskenazi Museum of Art, and the world’s largest and most visited museum. Before departing Paris, there was one more bit of business to attend to — a meeting on the campus of the Université Pierre et Marie Curie with senior leaders of UPMC, France’s top science and medical education university, and Paris Sorbonne Université, the country’s largest institution dedicated to the study of literature, languages, civilizations, arts and humanities, and the social sciences. 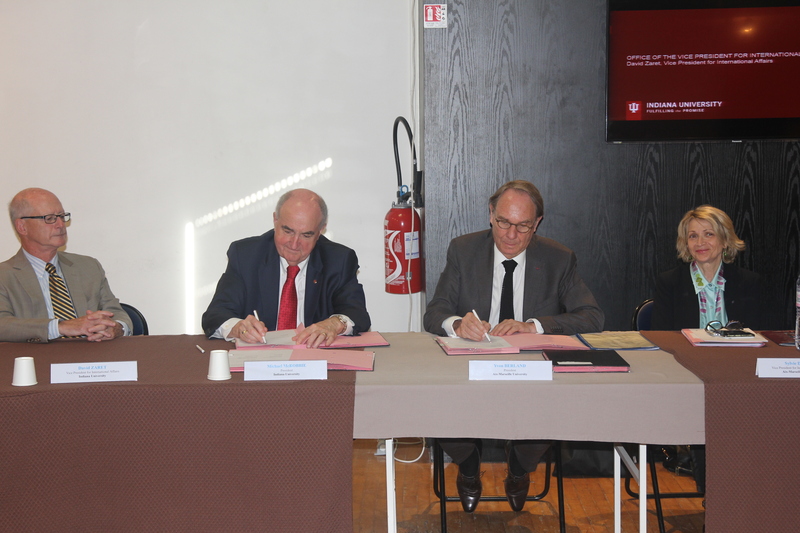 Next January, the two leading institutions will merge to form Sorbonne University, a new, comprehensive global university located in the heart of the historic Latin quarter of Paris, that is expected to rival some of the best in the world. 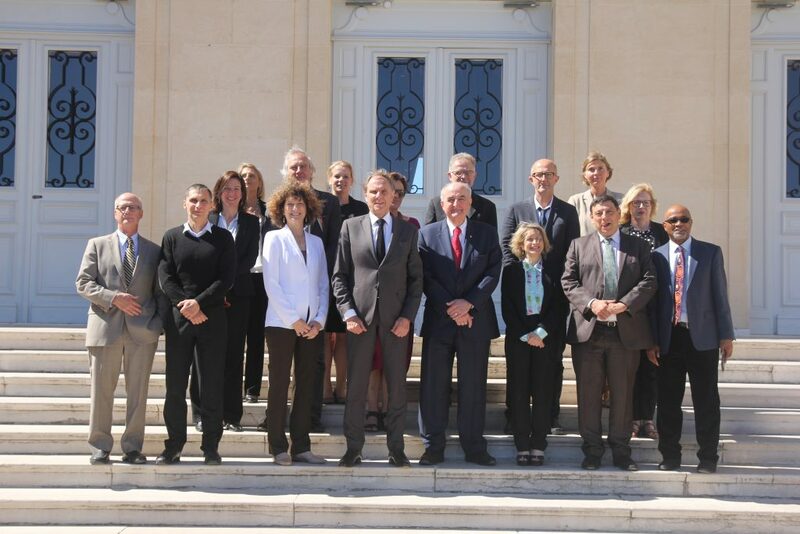 IU delegation members and leaders from the Université Pierre et Marie Curie in Paris. To this end, the new Sorbonne will include 58,000 students and 7,700 faculty researchers, working across a vast array of academic disciplines, including the humanities, engineering, energy, the environment and the life and health sciences. It will also exist on the strongest of teaching and research foundations, including two recent Nobel Prize winners in physics, three recipients of Fields Medals (also known as the mathematician’s Nobel) and faculty who make up more than one quarter of the members of France’s national science and medicine academy. Additionally, the university is connected to a broad network of several of France’s top national institutes representing such interests as scientific research, health and medicine, technology, business, education and the performing arts. Over the course of a couple of hours, IU and Sorbonne officials explored opportunities for potential collaboration around common interests — including increasing the amount of bilateral exchanges of students and faculty; reshaping academic programs to meet students’ emerging interests and ever-evolving educational needs (interestingly, both IU and Sorbonne have adopted a similar approach toward teaching media communications in all of its present and diverse forms); and fostering interdisciplinary research that addresses major issues of sustainable development, such as health, communications, biodiversity, environmental change, water and renewable energy. The meeting was a most fitting end to a productive, enlightening, rewarding and frequently inspiring trip. Admittedly, it’s going to be extremely difficult to say goodbye to our spectacular surroundings, the incredible art, trendy fashions and mouthwatering food, the kind hospitality we received everywhere we went, and the friends — new and old — that we encountered all throughout our travels. To those students we met in Aix-en-Provence who didn’t seem super excited to be packing up to leave for home earlier this week, I completely get it. To the alumni and former directors of IU’s Madrid Program who are quick to call Madrid their home away from home, I also get it. I’m pleased to report that IU’s connections in France and Spain — fueled by the university’s longstanding commitment to internationalization, including increasing our students’ global literacy — are strong and only getting stronger. Indeed, all signs point to even greater engagement that will spark new opportunities for students and scholars all across this great continent in the years ahead. Au revoir, and thank you for reading! View of the Paris skyline from a top one of the buildings at the Université Pierre et Marie Curie. 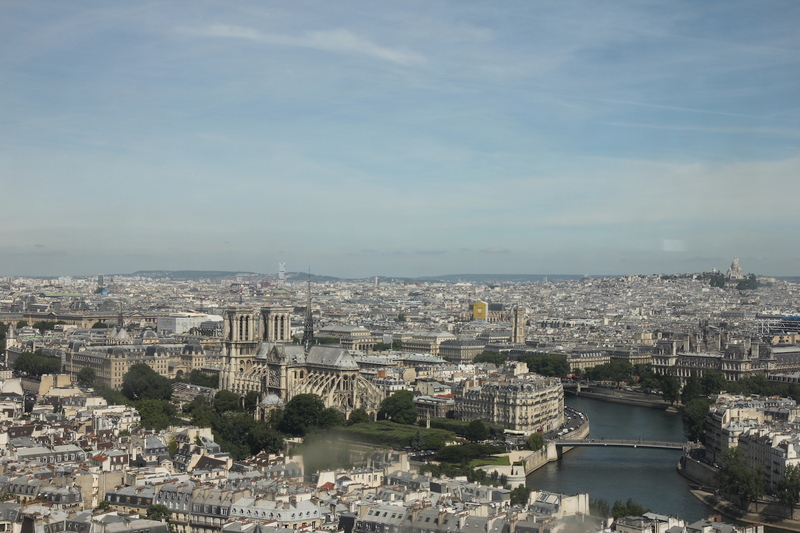 Bonjour, and welcome to Paris, this truly magnifique capital city and renowned center of business and high culture. Here, members of the IU delegation have — in the span of about 36 hours — honored and celebrated IU’s historic French connections, while simultaneously exploring new efforts to add to the university’s longstanding legacy of successful engagement in Europe. IU’s roots truly do run deep in France. Over the years, the university has welcomed scores of French students and scholars to its campuses. Furthermore, each year around 100 IU students choose to come to France to study a wide variety of subjects, such as art and design, history, French culture and language, law, international business, science, music and more. Their overseas study is made possible through strong and productive partnerships that several IU units supported by the Office of the Vice President for International Affairs — including the College of Arts and Sciences at IU Bloomington, Kelley School of Business, Maurer School of Law, School of Public and Environmental Affairs and Fairbanks School of Public Health at Indiana University-Purdue University Indianapolis — maintain with France’s top universities. IU also established one of its earliest study abroad programs in France. In 1965, IU formed a partnership with Purdue University that gave students the opportunity to study at the University of Strasbourg. When that arrangement ended in the mid-1990s, IU joined a partnership with the University of Wisconsin and the University of Michigan that enabled students to study in Aix-en-Provence. Members of the delegation had the privilege of visiting that program on Friday and getting to know the current cohort of IU students who are just concluding their year overseas. 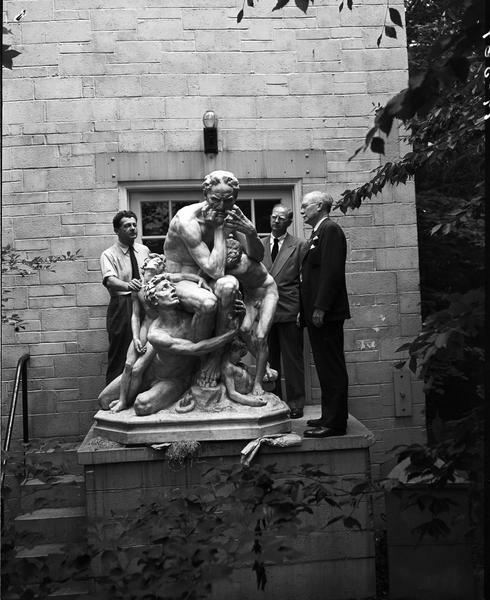 “Ugolino and his Sons,” by Jean-Baptiste Carpeaux, was a gift from the citizens of France in gratitude for “The Friendship Train,” which crossed the US in 1947, after WWII, to collect food from American donors. This photo, from 1949, is from the IU Archives Collection. There are several other interesting historic and cultural connections between IU and France. Ernest Bicknell, deputy commissioner to France during World War I, graduated from IU in 1887. Later he became director of the Rockefeller War Relief Committee and also earned the Legion of Honor from the French government for his humanitarian efforts. On IU’s Bloomington campus, the Indiana Memorial Union serves as home to a replica of “Ugolino and his Sons” by 19th century French sculptor Jean-Baptiste Carpeaux. The sculpture was a gift from the citizens of France in gratitude for “The Friendship Train,” which crossed the U.S. in 1947, after World War II, to collect food from American donors that was shipped to France and Italy as a gesture of goodwill and to assist in the war recovery effort. 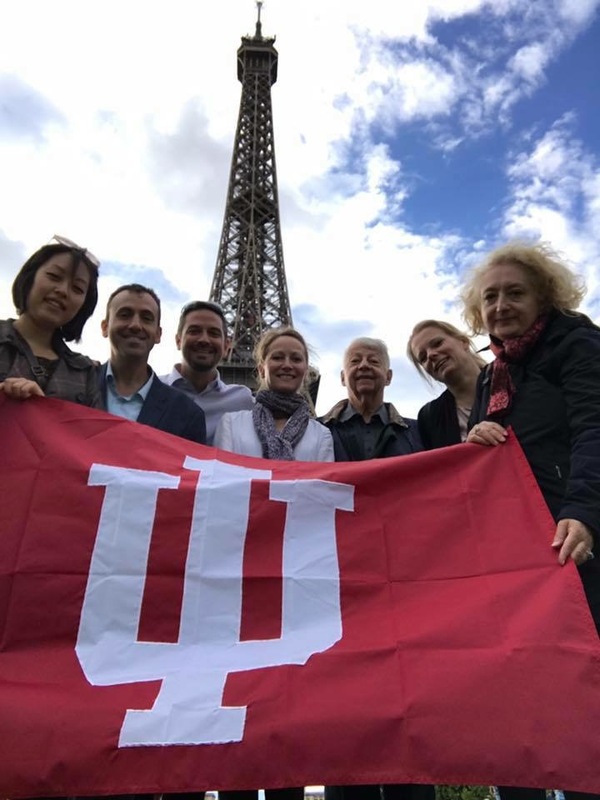 And then there are the nearly 350 IU alumni affiliated with France, several of whom, as IU delegation members were thrilled to find out during their trip to Paris, are working hard to ignite the IU spirit. As IU President Michael McRobbie is often fond of saying, the secret of the university’s success lies in the enthusiastic engagement of its graduates all over the world. IU alumni truly are the university’s greatest global ambassadors and, indeed, it was enormously gratifying to see how the group of Hoosier graduates with whom delegation members gathered in Paris Sunday afternoon has reenergized the university’s France alumni chapter as well as alumni activity all across Europe. IU Europe alumni leaders met up with members of the IU delegation at the famed Eiffel Tower in Paris. The reception included IU graduates who studied at IU in each of the last six decades and have gone on to successful careers in, among other fields, academia, art and music, business, law, media, science and technology. Joining the president of the IU Alumni Association chapter here in France were the leaders of the chapters in Switzerland and Germany. Collectively, they and their fellow chapter members represent IU’s growing global footprint across Europe and increasing activity in the region, much of which is being supported and advanced through IU’s new Europe Gateway office. The office, which opened in Berlin in 2015, is IU’s third such facility for international faculty, student and alumni activities, following the launch of similar offices in New Delhi and Beijing. At the Paris event, President McRobbie provided an update on recent progress at IU — including the establishment of the Berlin office, several new schools, academic programs and major initiatives — and a preview of the university’s bicentennial celebration, which will commence in the 2019-20 academic year. Afterward, several alumni talked about how eager they were to help the university send more Hoosier students to Europe for study abroad. Others talked about how they hoped to encourage more students from France and other European countries to study at IU. Many expressed excitement about the upcoming IU Bicentennial and said how they hoped, one way or another, to make it back to Indiana to take part in the celebration. Indeed, the alumni were having so much fun reuniting, reminiscing and making plans for future get-togethers that almost no one wanted to leave, a clear reflection of just how the large l’esprit de IU is here in France. As busy as President McRobbie and his colleagues have been renewing ties with IU’s international alumni, they have been equally engaged in exploring promising new educational and cultural connections in France toward the goal of expanding overseas opportunities for students and faculty. 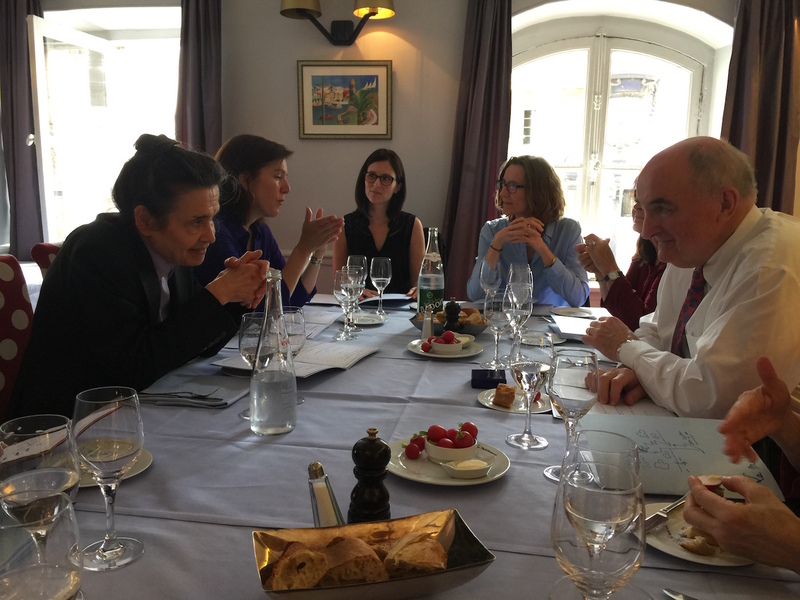 To this end, IU delegation members participated in meetings today with faculty leaders at University Paris II Panthéon-Assas, France’s first and most prestigious law university and a school with a distinguished pedigree. 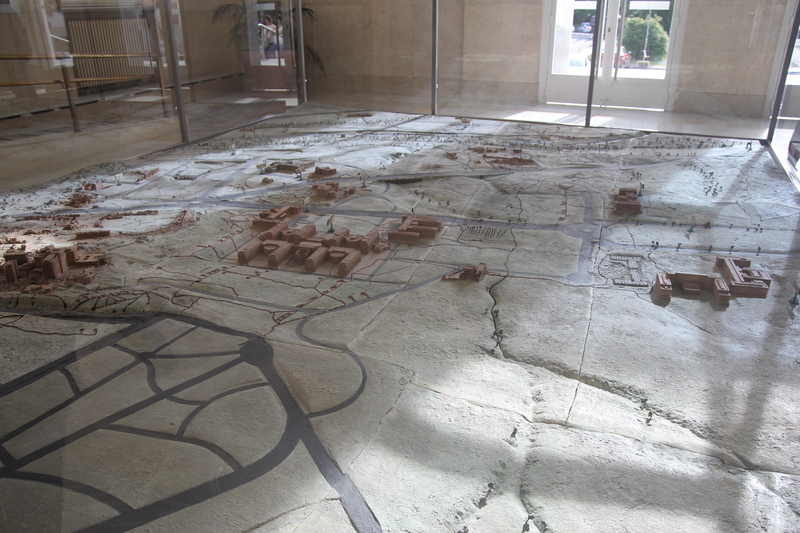 Since its founding, Paris II has produced two presidents, four prime ministers and nearly 40 ministers in France and around the world. In addition to law, Paris II also boasts strong academic programs in, among other areas, economics, management, political science and information and communications science. 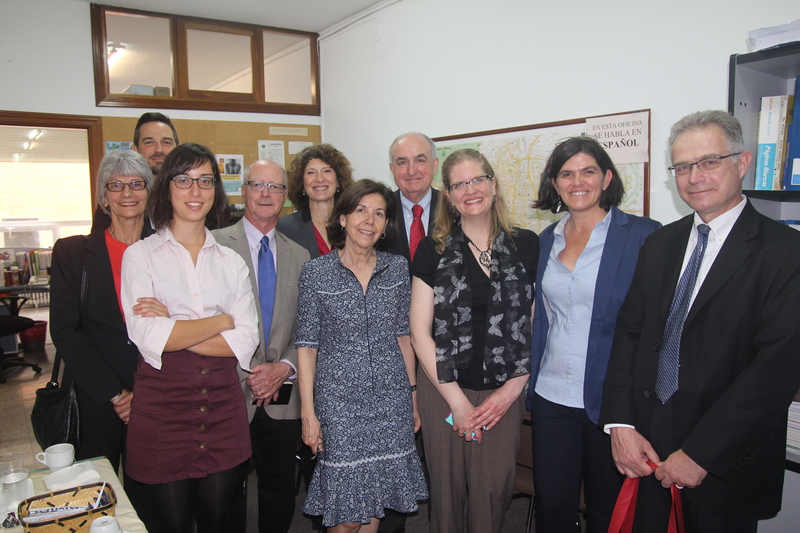 IU President Michael McRobbie meets with top faculty at Université Paris II Panthéon-Assas. Today’s meetings centered around efforts to potentially expand upon what, in recent years, has proven to be a productive relationship between IU and Paris II. That relationship has resulted in short-term and semester-long exchanges of law students and faculty. Following the meetings with Paris II personnel, IU delegation members met with officials at the U.S. Embassy office in Paris, where they received a briefing on higher education issues in France, including the impact of the recent French presidential election. Kindly leading us through a whirlwind tour of a small part of the Louvre (as those who have visited the museum well know, you need several more days and you still wouldn’t see all of this simply overwhelming museum) was Marie-Anne Dupuy-Vachey, an art scholar and former curator at the Louvre. She is married to a descendent of Dominique Vivant-Denon, an artist and author who was the director of the Louvre under the emperor Napoleon and who is commemorated in the Denon wing of the museum. As it turns out, the IU Eskenazi Museum of Art owns a wonderfully detailed portrait sculpture of Denon, which Marie-Anne visited in Bloomington just last year. Of course, there’s also an architectural link between the Louvre and IU; the glittering glass pyramid (the “Pyramide du Louvre”), through which hundreds of thousands of visitors enter the museum, was designed by the world-renowned architect I.M. Pei. Pei, who recently celebrated his 100th birthday, also designed IU’s top-rated art museum, which, just several days ago, began a $30 million renovation that will fully modernize the museum in time for IU’s Bicentennial. Marie-Anne led the group of us as quickly as she could through several of the seemingly endless exhibition halls of the Louvre, stopping in places just long enough for us to see several works that were simply awe-inspiring. My personal favorites: the 8-foot-tall marble statue “The Winged Victory of Samothrace” and “The birds,” a painting by George Braque that adorns the ceiling in the museum’s Henri II room. We had little time to see much more, sadly, in our tightly packed schedule of meetings. Nevertheless, we parted ways with Marie-Anne with the strong hope that IU’s unique connections to the Louvre might lead to the development of future joint opportunities with this grandest of all museums and further increase IU’s remarkable foothold here in France. Imagine, if you will, that you’re a 19- or 20-year-old college student preparing, for the first time, to embark on a semester or year of overseas study in a foreign city — perhaps a place like Aix-en-Provence, the charming, picturesque little city here in the south of France and just 20 minutes north of Marseille. Of course, that’s a gross generalization of overseas study, and I’d be remiss if I didn’t point out that every place students choose to travel internationally is unique. Still, listening Friday morning to a group of IU students who have immersed themselves in study abroad here in France for the past year share their stories and talk openly about the various challenges they’ve overcome — both in the classroom and in their living communities — provided a pretty insightful picture of what it means to be a college student studying abroad. Their remembrances also highlighted the remarkable rewards overseas study can offer and the life-changing effect it almost always has. 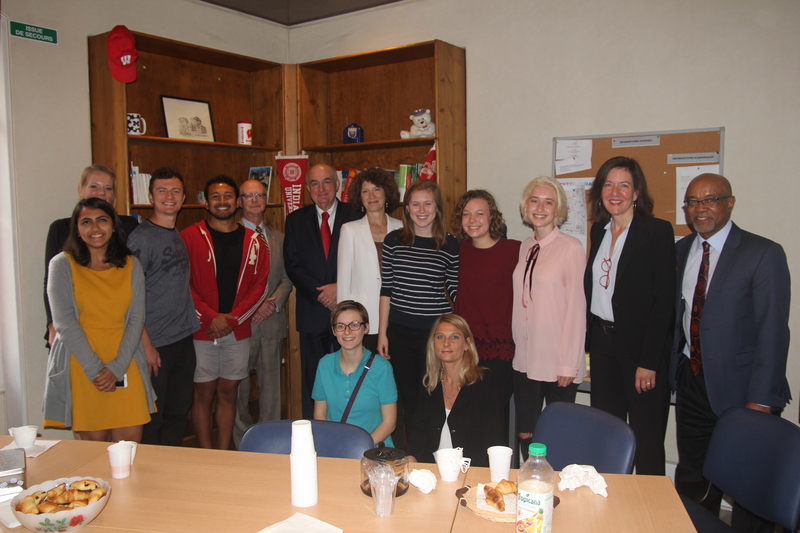 The 10 students with whom IU President Michael McRobbie, Vice President David Zaret and their colleagues enjoyed breakfast coffee and croissants are just wrapping up a year spent in the Aix-en-Provence Program, which IU shares along with its partner and program founder, the University of Wisconsin-Madison. As members of the 55-year-old program, which IU has helped manage since 1997, students have the opportunity to deeply immerse themselves in, among numerous subject areas, French language, civilization, culture, history and social science. The students take courses, all of which are all taught in French, at Sciences Po Aix, a political institute in France, or Aix-Marseille Université, the country’s largest university with around 70,000 students. When not in school, they live in a French household or apartment where French is also most commonly spoken. Despite the early hour and fact that most of them were preparing to leave France within the week (one young woman was preparing to depart tomorrow), the students who shared with us their stories today were remarkably poised, passionate and articulate about their time here in their adopted home of Aix. With their program director Aliko Songolo, a professor of French and African cultural studies at UW-Madison, proudly looking on, they thoughtfully expressed their feelings about and experiences with, among other issues, navigating the substantial differences between the U.S. and French university systems; integrating themselves into — and frequently disrupting — a college culture that demands strict specialization and self-oriented learning; figuring out how to meet their teachers’ expectations when those expectations weren’t always made known; finding connections with the people who live here and only speak the native language; traveling to other major European cities; and assimilating themselves into an entirely new culture and customs. As much as I’d like to share what every student told us because each was so impressive in his or her own right, the following represents a few select highlights of the conversation. Two young men, both of whom were childhood friends from Columbus, Ind., — one studying French in IU Bloomington’s College of Arts and Sciences and international studies at the IU School of Global and International Studies; the other a French and neurosciences major — said that they and their fellow classmates initially struggled with some of the expectations placed upon them by their professors and the cultural differences with their French-resident classmates. Eventually, they said, by working hard to be more adaptable, culturally accepting and empathetic, they managed to “find” and successfully integrate themselves into their new surroundings, succeed in the classroom and meet new friends. A young woman who is an English major and is also participating in IU’s Liberal Arts Management Program talked openly about the overall mental fatigue she faced early on in the program and, more specifically, only understanding about 30 percent of the French language being used by faculty in her classes. By the end of the last semester, her understanding was up to 80 percent. Among the last to speak was Rachel Rosenstock, a journalism student in IU’s new Media School and French major who admitted that this last year — her seventh studying French– was truly a “make it or break it point” for reaching her goal of becoming fluent in reading, writing, speaking and comprehending the language. Fortunately, she made it. “I really gave it my all, but I really needed to push to not just fall back on my native tongue,” said Rosenstock, who wrote a wonderfully descriptive series of columns for the Indiana Daily Student newspaper last year chronicling her time in Aix-en-Provence. Over more than a dozen reports, she shared what it felt like to leave her family and friends in August to spend the next 10 months in France; her attempts to capture the various “rhythms” of French living, including settling into a new home and managing routine chores like grocery shopping; and the progress she’d made in her first semester in the program toward meeting her goal of mastering the language; and her frequent travels from Aix to other parts of France, as well as Austria, Belgium, the Czech Republic and Norway. Indeed, as the Aix program students gathered around the IU president for a group photo, one couldn’t help but feel proud that IU’s pathbreaking study abroad programs — in places like Aix, in Madrid, where we just celebrated a 50th anniversary, and in Bologna, Italy, where we were a year ago for another golden anniversary — are truly making a major impact in transforming lives and turning out a new generation of truly global citizens. After wishing our students well, delegation members took a short walk from the study abroad offices to the center of the Aix campus of Aix-Marseille Université, pausing several times along the way to take notice of a number of major building projects (not unlike some of the extensive construction efforts at IU) that clearly reflect substantial change and renewal taking place across the university. 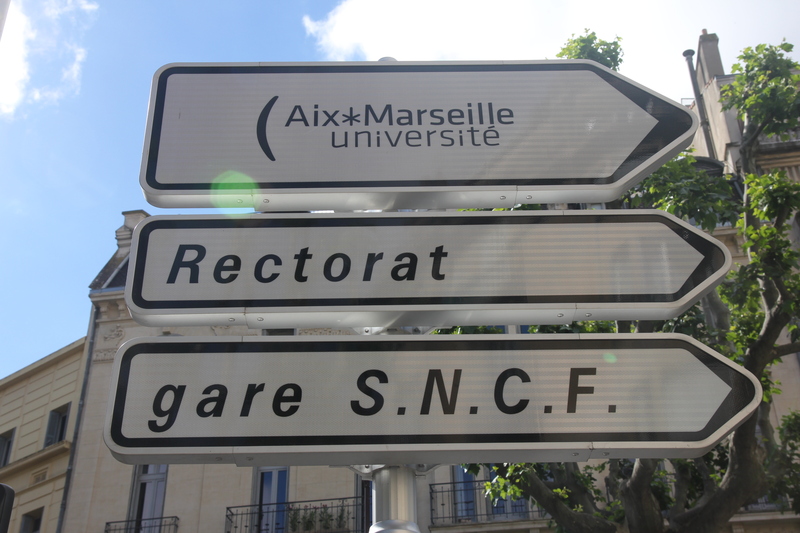 A street sign points the way to the Aix-Marseille Université campus in Aix-en-Provence. 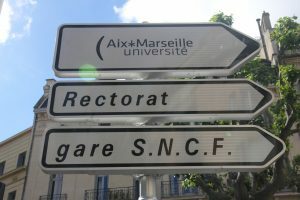 With more than 75,000 students, including some 10,000 international students, 8,000 staff, 19 academic departments, 130 research units and five large campuses, including the one here in Aix-en-Provence and another in the southern coastal city of Marseille, AMU is the largest university in the French-speaking world and one of the best in this region of the world. As one faculty member neatly expressed, AMU is “very old” (its origins go back to the early 15th century when it was the University of Provence) and also “very new.” A merger five years ago with the University of the Mediterranean and Paul Cézanne University resulted in AMU’s creation and an energetic effort to enhance the university’s overall education, research and international engagement. To this end, AMU’s Aix campus is building upon its widely respected array of teaching and research programs in the arts, languages (AMU teaches more than 50), humanities, social sciences, economics and management — all of which neatly align with IU’s strengths, a fact that Vice President Zaret and his respective counterpart at AMU, Vice President for International Relations Sylvie Daviet, were each quick and pleased to recognize as potential pathways to new student and faculty exchanges and meaningful collaborative research projects. “I’m definitely hearing a lot of places where we have synergy and possible opportunities for overlap, particularly in the liberal arts and humanities, in the languages and in our professional schools that are extremely active in international engagement,” Zaret said. 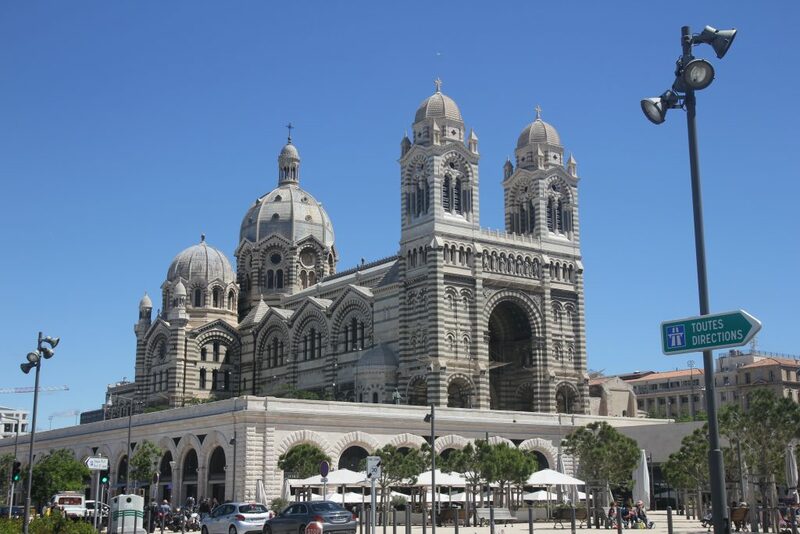 From there, members of the delegation broke to board a bus that would transport them to AMU’s other main campus, located in France’s spectacular city by the sea, Marseille. 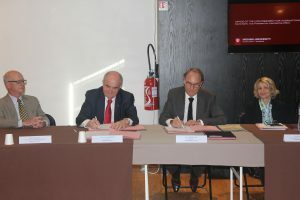 IU President Michael McRobbie and Yvon Berland, president of Aix-Marseille Université, sign a renewed agreement between AMU and the School of Engineering and Technology at IUPUI. A cool breeze, bright sunshine and a sparkling Mediterranean Sea, upon which sailboats and other ships calmly bobbed, greeted IU delegation members as they descended upon the Côte d’Azur, known in English as the French Riviera. Tempting as the surroundings were, there was more work to be done and more productive sessions to be had. At the campus’ scenic headquarters perched above the sea, Vice President Daviet was joined by leading faculty members representing AMU’s programs in science, research, engineering and medicine who presented their vision for applying university research to address the great societal challenges facing the European region and, in turn, took great interest attention in several recent developments at IU. In particular they wanted to learn more about IU’s investment in “Prepared for Environmental Change,” a major new initiative, which is funded through the university’s $300 million Grand Challenges Research Program, to protect the health, jobs and livelihoods of Hoosiers. Before the bus ride back to AMU, there was one last bit of business to be completed, as McRobbie and AMU President Yvon Berland inked a renewed agreement between AMU and the School of Engineering and Technology at Indiana University-Purdue University Indianapolis that has facilitated student exchanges between the two schools since 2002. It was a fitting end to a day that began and ended with our students and the potential for them to make themselves — and the world — better through the transformative power of a global education. The Marseille Cathedral, a national monument of France. 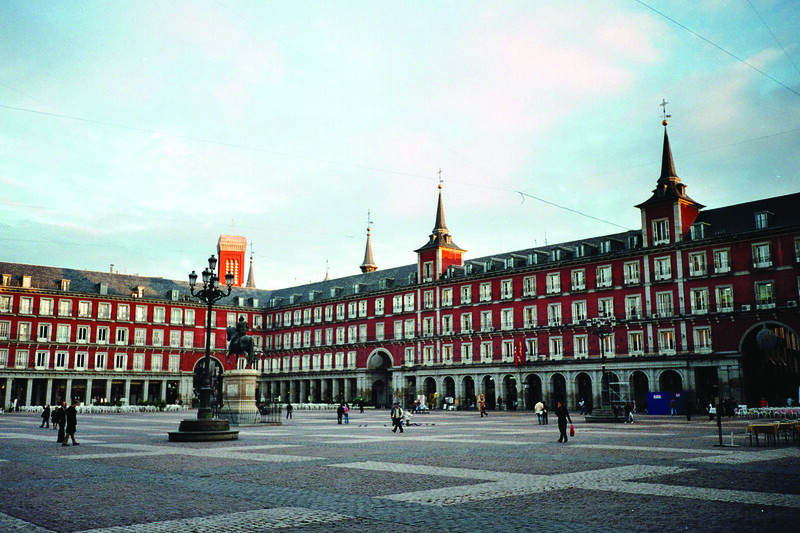 There is little not to love about this city — its sloping, winding streets (or calles) lined with cafés, shops, food stands, tapas restaurants and taverns; its pretty plazas, including the central Plaza Mayor, one of the most famous city squares; its majestic cathedrals and palaces; its nightlife (Madrid doesn’t really get going until way past my typical bedtime); and, of course, its renowned museums, including the Prado, Madrid’s most important museum and one of the best, if not the best, museums in the world. It’s easy to see why the great Hemingway — known to the Spanish as “Don Ernesto” and a passionate patron of bullfights and, ahem, bars — returned here again and again and saw fit to weave the city into so many of his famous novels and short stories. I have a feeling if we stayed here another week, we still would only scratch the surface of a city so culturally, historically and politically vibrant. It’s also easy to envy the scores of IU students who have studied here over the last half century through the path-breaking Madrid Program, which has set an extremely high bar — as IU delegation members have learned over the last 48 hours — for immersive and inspiring study abroad that can truly change students’ lives. Around mid-day on Wednesday, members of the IU delegation wound their way through the center of the city and up several of Madrid’s many hills to the centerpiece activity of our trip here to Spain — a celebration of the 50th anniversary of the Madrid Program. The program is also commonly referred to as the WIP Program in reference to its three main members: co-founders IU and Purdue, and the University of Wisconsin, which joined the program in 1970. 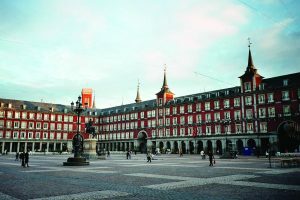 The program — which provides students with the opportunity to live independently in Spain, among Spanish speakers, and to gain a deep appreciation for Spanish culture — is one of the oldest and most successful of its kind and a standard-bearer for successful study abroad within IU and across the nation. Around 100 past and present “Wippers” (as the students affectionately call themselves) were on hand for the event, along with former resident directors representing the program’s five decades of activity, current WIP staff, IU alumni living in the region and representatives from each of the WIP schools as well as Tulane University, whose students are included as part of WIP’s enrollment. IU President McRobbie speaks to a couple of students during the 50th anniversary celebration of IU’s study abroad program in Madrid. For an early afternoon gathering, which included a long lunch and series of formal remarks, there was a palpable excitement in the warm afternoon air, fueled by the youthful energy and spirit of the new nattily dressed students, several of whom would participate in a graduation ceremony later that evening (more on that in a bit), as well as the happy and enthusiastic alumni, for whom the event offered an opportunity to reconnect with their former classmates and relive memories of their time in Madrid. Sideli is one of the many alumni whose life “has never been the same” because of her intimate involvement with the program both as a student and as an advisor. (She was a student in the early 1970s and also served two separate stints as a graduate assistant before becoming managing director in 2003.) In her remarks, Sideli talked about arriving in Spain as a student who “didn’t know a soul” and how she quickly fell in love with the city and its people. She also paid tribute to the WIP Program and the larger consortium of U.S. universities, known as the Universidades Reunidas, for sending thousands of other students to Spain for immersive, academically rigorous and culturally challenging experiences that have prepared them to become “true global citizens,” a theme that runs throughout the meticulously prepared history of the program that she put together in advance of the golden anniversary celebration. As if on cue, several former resident directors, including IU Professor Emeritus Robert Arnove and IU Associate Professor Reyes Vila-Belda, and program alumni, such as Margo Persin, an IU graduate who is now a professor emeritus at Rutgers, spoke warmly and fondly about the incredible moments they had as students here. They also talked about the strong bonds they have forged with their fellow program participants and the preparation they received that has enabled so many alumni to go on to successful careers — in academia, business, government and non-governmental organizations, and other professions. IU President McRobbie, assisted by IU Associate Vice President for Overseas Study Kathleen Sideli, presents Maria del Carmen Castaño Collado, longtime assistant director of the WIP Program in Madrid, with IU’s distinguished international service award. Many spoke glowingly about the lasting friendships they’ve made and the dedicated staff who supported them while in Madrid, such as Maria del Carmen Castaño Collado, longtime WIP assistant director. Judging by the popular opinion of current and former students, Mamen is a real rock star here in Madrid and the glue of the program, which made it even more special when McRobbie presented her with IU’s Distinguished International Service Award in recognition of the contributions she has made toward promoting international understanding and service. The most inspiring part of the afternoon event, though, might’ve been seeing the 50 or so current Wippers in the room, who collectively reflect the increasing diversity of the program and student profile (nearly 30 of the students are double majors and five are triple majors!) happily interact and share common remembrances with their forebearers, for whom Facebook, text-messaging and Twitter would’ve been unfathomable when they studied here. The ceremony was held in the historic Facultad de Filosofía building on the campus of the Complutense University of Madrid, home to WIP and Reunidas since the start of both programs and one of the oldest universities in the world. Ambassador Capricia Marshall served as keynote speaker for the evening celebration. An alumna of the WIP program and Purdue, she served as chief of protocol for the Obama Administration for four years. In her remarks to the graduates, which she frequently peppered with light-hearted moments from her time as a WIP student in the mid-1980s and her fond memories of Madrid’s famous culinary and beverage delights, Marshall emphasized the importance of study abroad and the impact it can have, by ensuring greater numbers of globally literate and culturally sensitive citizens, on improving international relations around the world. IU President McRobbie presents Carlos Andradas Heranz, rector of the Complutense University of Madrid, with IU’s Thomas Hart Benton Medallion. 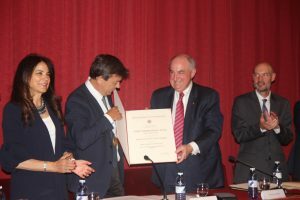 McRobbie paid special tribute to the Complutense University of Madrid and the support, cooperation and goodwill it exhibited during the 1960s in openly welcoming U.S. students to Spain and integrating them into the university at a time when our nation’s activities in the international arena were controversial. This was also a time, McRobbie added, when CMU, like many other universities, faced its own internal challenges. “Over the years, students in the program have had a remarkable opportunity to witness firsthand Spain’s transition to democracy as well as the country’s maturation as a modern, democratic nation,” McRobbie said. McRobbie also noted the symbolism of the historic building in which the ceremony was held — the Filosofia building. 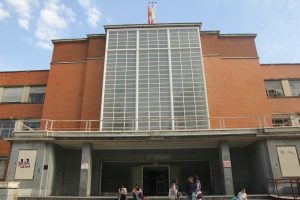 The building served as a military base for the International Brigade, which included a number of American soldiers, in the battle of Madrid during the Spanish Civil War (1936-39), a savage conflict that split the campus in two. To formally honor the longstanding collaboration with CMU and the benefits it has delivered to IU and all of the universities involved in the Reunidas partnership, McRobbie presented CMU Rector Carlos Andradas Heranz with IU’s Thomas Hart Benton Medallion, awarded for meritorious international service to IU or exceptional achievements worldwide. 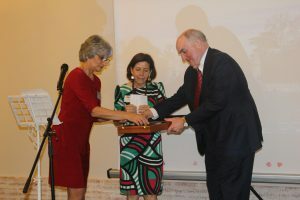 At the end of the celebration, McRobbie and Heranz would head over to a special reception for rectors of several top Latin American universities, a clear sign that the two leaders, who also had a lengthy meeting on Tuesday afternoon, looked forward to even greater collaboration in the future. But first it was time for the newest WIP and Reunidas graduates to take their turn in the spotlight. Watching them accept their diplomas, throw on their graduation sashes and present themselves as new alumni to an adoring crowd, we all could take enormous pride in their achievements and the hallmark programs that gave them such remarkable opportunities here in Madrid. 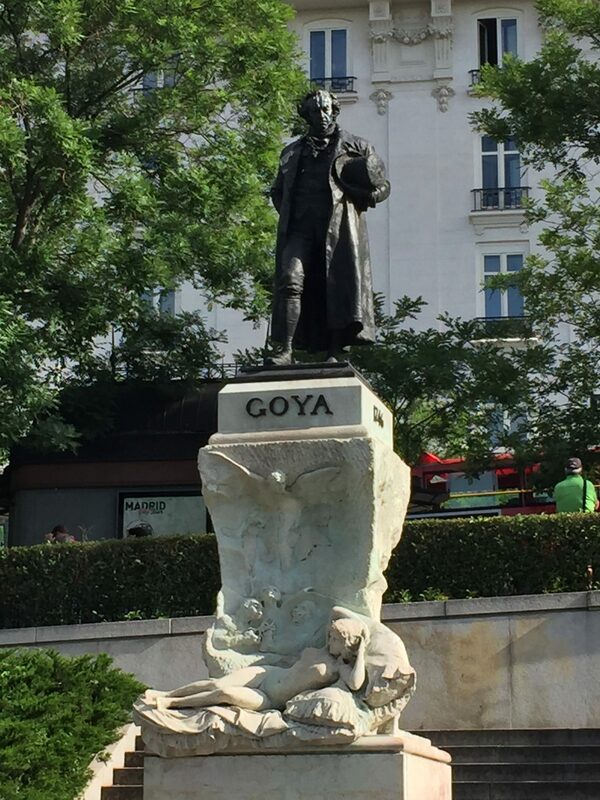 Speaking of those opportunities … a quick word about the delegation’s morning in Madrid and what could easily be the definition of a crash course in cultural immersion — an hour-and-a-half long, “just the hits” tour of the world-renowned Prado Museum. Statue of Francisco de Goya outside of the Prado Museum in Madrid. 8,200 drawings. 7,600 paintings. 1,000 sculptures. A who’s who of the European masters — Bosch, El Greco, Goya, Rubens, Titian, Velázquez. All are featured in Spain’s main national art museum, home to one of the world’s finest collections of European art and one of the world’s most visited cultural venues. “If [Madrid] had nothing else than the Prado it would be worth spending a month in every spring,” Hemingway wrote. A bright, spirited, extremely informed and — fortunately — fast-talking young woman, who is a curatorial fellow at the Prado and is a Ph.D. candidate at Columbia University, served as our morning tour guide, leading us through a dizzying sprint through the museum’s massive galleries. While it was challenging not to stop to admire the astonishing art at every turn, we somehow managed to make it to such extraordinary masterworks as Las Meninas (The Family of Charles IV) by Velazquez, Titian’s Equestrian Portrait of Emperor Charles V at Muhlberg, Goya’s The Third of May, and the Garden of Earthly Delights by Bosch. I couldn’t possibly do any of the aforementioned justice in the space I have here. I will just say that each would end up on anyone’s short list of the best paintings in the history of the world. Moreover, each is simply stunning, and when it was time, sadly, to leave the Prado, I could not keep from thinking about just how lucky our students are to be studying with such a marvel of a cultural resource in their backyard. Click below for a video of the full commemoration ceremony for the 50th anniversary of the Universidades Reunidas. President McRobbie begins speaking at around the 46-minute mark. 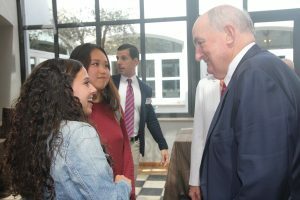 After touching down early in the morning in Madrid, members of IU’s delegation, including IU President Michael McRobbie and Vice President for International Affairs David Zaret, wasted little time in getting acquainted with the history of the university’s hallmark study abroad program here in the political, economic and cultural center of Spain. Wednesday will mark a formal celebration of the golden anniversary of IU’s Madrid Program and recognition of the consortium of U.S. universities, known as the Universidades Reunidas, that has enabled thousands of students to study abroad in Spain’s capital and largest city. During the festivities, which include a reunion event and graduation ceremony, many of those students will be reunited with their old classmates and resident directors and also have an opportunity to interact with current participants in the program. Tuesday, though, was mostly a day for learning about what it takes to be a successful university study abroad program, the talented and dedicated people who make it work and the remarkable place that has provided IU students in Spain with a home away from home that few universities around the world can rival in terms of age, academic prestige and endurance in the most challenging of circumstances. As recounted in a wonderfully detailed history compiled by IU’s longtime overseer of overseas study (and proud Madrid Program alumna) Kathleen Sideli, IU’s Madrid Program began in 1965-66 as a partnership between IU and Purdue University to provide a year-long study abroad experience for advanced students of Spanish. Within a year, the initiative spawned a wider consortium, the Universidades Reunidas, which collected the resources of several U.S. institutions and contracted with the University of Madrid (now the Complutense University of Madrid) for special courses and office space. In 1970, the University of Wisconsin joined IU and Purdue in the consortium, which today is often known as the WIP (Wisconsin-Indiana-Purdue) Program. From its modest beginnings, the program paired students with many of the most preeminent Spanish scholars, including renowned poets, philosophers and historians, while also setting a standard — of immersive and impactful learning and a close relationship with the program’s host institution — that has defined IU’s overseas study efforts for the last half century. Merle Simmons, a professor of Spanish and folklore who oversaw IU’s study abroad programs in Peru and Mexico at the time and who was then chair of IU’s Foreign Study Committee, was instrumental in the founding of the Madrid Program. In 1966, he wrote a letter to a colleague that addressed the type of rigorous and rewarding program he and others hoped to establish in Madrid and that still resonates in the program today. 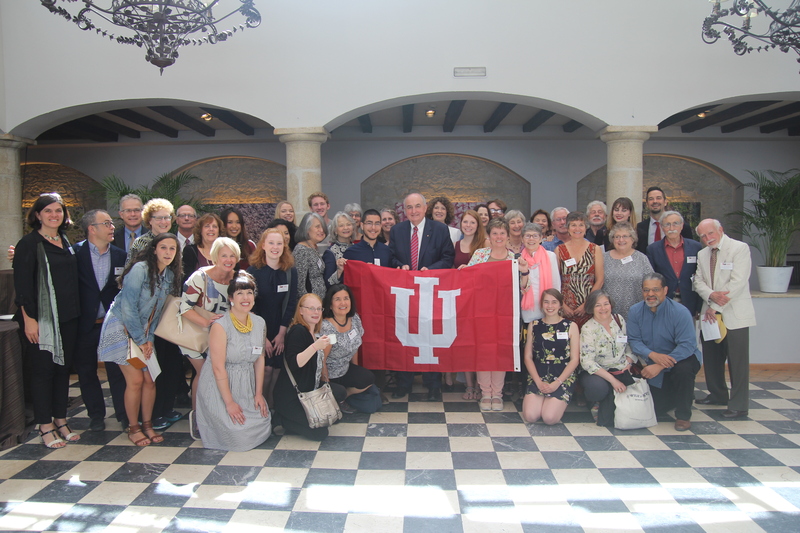 On Tuesday afternoon, IU delegation members met up with Dinverno and two of her colleagues who provide hands-on, on-the-ground personal and academic support for the program in Madrid, which IU has managed for the last two decades. The program currently includes more than a dozen IU students who are here for a full year of academic study. More and more students are entering the program with double or triple majors, Dinverno says, and while most will study Spanish language, literature, culture and history, increasingly they are arriving with academic interests in areas such as media communications, informatics and, in the case of one student last year, astrophysics. IU delegation members pose for a picture with Madrid Program staff. For its entire existence, the Madrid Program has been based at the main campus of the Complutense University of Madrid, Spain’s most prestigious university and one of the oldest universities in the world with its origins dating back to the late 13th century. With a student body totaling more than 86,000 students, CMU has played a major role in the academic and political development of Spain, and its impressive roster of alumni includes many of Spain’s most renowned and respected philosophers, writers, historians, government and military leaders, and scientists. On Tuesday, CMU Rector Carlos Andradas Heranz welcomed members of IU’s delegation to his office in the heart of campus for a conversation that allowed President McRobbie to express the university’s gratitude toward CMU for its “generous and visionary commitment” to supporting IU’s study abroad efforts in Spain. During the meeting, the leaders of both institutions also talked about their shared interest in further strengthening their respective schools’ international engagement efforts — including sending more students abroad for overseas study, enabling more faculty to pursue scholarly and research collaborations with their peers at top universities around the world and strengthening connections with international alumni. For his part, McRobbie discussed IU working to expand its presence in Europe through the IU Europe Gateway office in Berlin, launched in 2015 to increase the visibility and impact within the region of IU’s academic and research activities. 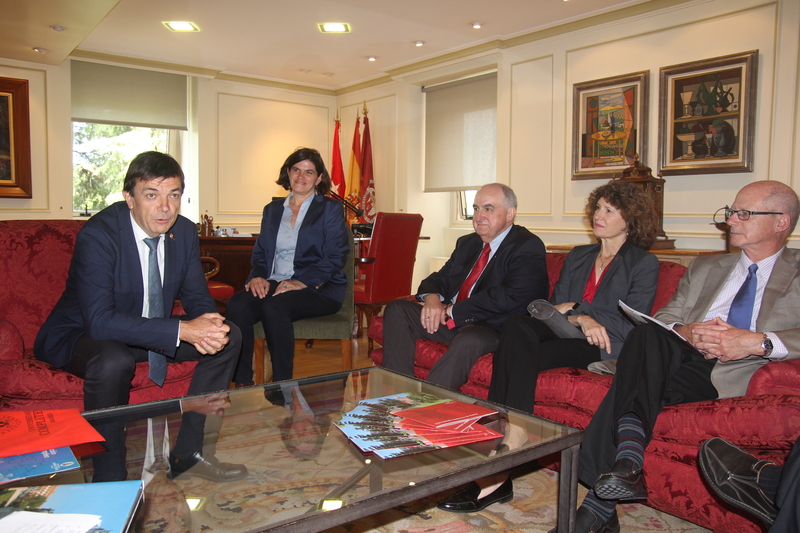 Members of IU’s delegation meet with Complutense University of Madrid Rector Carlos Andradas Heranz. Following the meeting with the rector and at the close of a busy first full day in Madrid, delegation members were given a brief tour of the CMU campus, which highlighted just how extraordinary a learning environment the campus is for the IU students who study here. CMU’s history includes, among other notable milestones, becoming one of the greatest centers of academic excellence in the world during the 16th and 17th centuries, when it was home to many of the leading scholars and thinkers of those time periods; becoming one of the first universities in the world to grant a doctorate to a female student; and awarding a Doctor of Science degree Honoris Causa to Albert Einstein, the first such degree Einstein accepted from a European university. At the time of the bloody Spanish Civil War (1936-39), the campus was the front for much intense fighting between the Republicans and the rebel Nationalists, led by General Francisco Franco, who would rule Spain for 36 years, from 1939 to his death in 1975. During the fierce conflict, the campus was essentially divided in two and carved up by multiple military trenches. Ultimately many of the buildings that had been constructed in the seven years leading up to the war were completely destroyed. This included the campus’ Facultad de Filosofía, where part of tomorrow’s 50th anniversary celebration will be held and where the Madrid Program offices were once located. With the war raging, the building housed members of the International Brigade, the group of foreign volunteer soldiers from about 50 countries, including the U.S., who fought on the Republican side against the Nationalist forces. The Filosofia Building at the Complutense University of Madrid. After the war, the original buildings, like the Filosofia building and the Facultad de Medicina, which delegation members also toured, were repaired or rebuilt, and several new buildings were added, including a number distinctly developed in the modern architectural style of some major U.S. universities. The original buildings still carry battlefield markings, such as bullet holes, that one can’t help but view as a reflection of the university’s remarkable resilience. Today’s meetings and tour offered an opportunity to consider the profound impact of IU’s Madrid Program over the last half century and the historic partner that has greatly contributed to its success. As we drove away from the CMU campus, it was difficult not to look forward to Wednesday’s formal celebration of that collaboration and meeting the many alumni and others who have made the program a shining example of IU’s longstanding emphasis on meaningful and enlightening study abroad in the most historically, economically, politically and culturally important cities of the world. 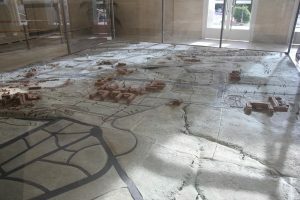 A model representation of the devastation endured by the Complutense University of Madrid campus during the Spanish Civil War. Hola, bonjour, and welcome to the IU Goes to Spain and France 2017 blog! As members of an Indiana University delegation set the stage for what promises to be an exciting and productive trip to two of Europe’s most dynamic and historically important countries, our university is in the closing stages of another successful commencement season. After this weekend, IU will have graduated a new record of more than 21,000 students who represent one of the most academically accomplished classes in IU’s nearly 200-year history and — we are extremely proud to say — one of its most globally literate and engaged. About a third of IU Bloomington’s class of 2017 had participated in an overseas study experience before graduating last weekend, and the campus currently ranks in the top 10 out of over 1,200 U.S. universities in the number of students who study abroad. These remarkable figures reflect IU’s continuing strategic emphasis on ensuring its graduates leave the university with the skills and experience they need to thrive in today’s increasingly interconnected global marketplace. It also highlights just how far globally-focused universities like IU have come in advancing study and service abroad as essential components of contemporary higher education. All of this is a far cry from 50 years ago, when study abroad was far less prevalent an activity and certainly not expected by our students. Which brings us to Madrid, the first stop on our trip, which is being organized by IU’s Office of the Vice President for International Affairs. In 1965-66, IU, in partnership with its friendly in-state rival Purdue University, had the foresight to initiate what has become, over the last half century, one of the major hallmarks of IU overseas study, the Madrid Program. Originally designed for advanced students of Spanish, the program — also commonly known as the WIP program (named for IU, Purdue and the University of Wisconsin, which joined the partnership in 1970) — has enabled almost 3,000 students to study in Spain’s capital and largest city. For the last two decades, IU has managed the WIP consortium and for 50 years has participated in the larger consortium of U.S. universities, known at the Universidades Reunidas, that sends students through the program. The program is based at the Complutense University of Madrid, Spain’s most prestigious university and one of the oldest universities in the world, dating back to the late 13th century. 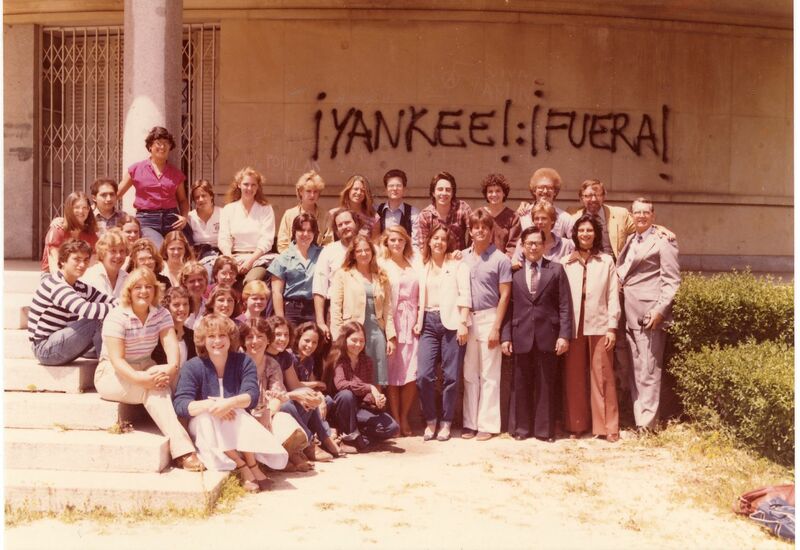 Almost 3,000 students, including these students from the 1980-81 class, have participated in the Madrid (or WIP) Program, which IU co-founded. Next week in Madrid, IU President Michael A. McRobbie and his fellow delegation members will join students, staff and alumni in celebrating the golden anniversary of this groundbreaking program, which has played an integral part in IU’s effort to increase the number of its students studying abroad and heighten its overall international engagement. 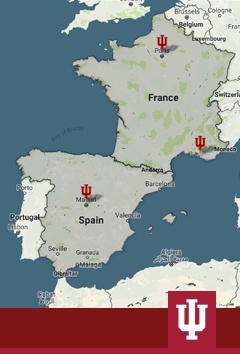 The anniversary celebration is the centerpiece of IU’s 10-day trip to Spain and also to France, which will begin on Monday, May 15. While in France, members of the delegation will meet up with IU students studying abroad as part of the Aix-en-Provence Program. As part of the program, which IU shares with the University of Wisconsin, IU students have the opportunity to learn about French language, civilization, culture, history and social science alongside French and international students at Aix-Marseille Université, France’s largest university with around 70,000 students. The university was founded in the early 15th century. As with past official IU international trips, IU delegation members will use their time abroad to strengthen connections with several of the world’s top universities, such as the Université Pierre et Marie Curie, Université Paris-Sorbonne and Université Paris 2 Panthéon-Assas, as well as with government, business and cultural leaders. They will seek to enhance IU’s engagement in Europe through the university’s ever-expanding Global Gateway Network, including the IU Europe Gateway office in Berlin. And they will renew ties with IU’s many alumni living and working overseas and who, as our previous trips have proven, truly are the university’s greatest global ambassadors. As for me personally, I’ll have the pleasure of serving as your eyes and ears to IU’s time in Spain and France. I’ll share with you first-hand, real-time reaction to the delegation’s daily activities and adventures, as well as some history surrounding IU’s longstanding engagement in Europe and insights into the university’s continuing work to elevate its profile in the most strategically important regions of the world. I hope you will follow along with the blog and check in regularly as I share news, photos and updates, and please feel free to reach out to me directly with questions at rpiurek@iu.edu. Thanks for joining me, and more soon from Spain! Welcome to the IU Goes to Spain and France blog. Visit this site regularly for stories and insights into Indiana University’s trip to two of Europe’s most historically important and economically dynamic countries. Here you will also find information about IU’s extensive international resources, longstanding educational and cultural engagement efforts in Europe, and new international initiatives, including the continued expansion of the IU Global Gateway Network. A graduate of IU's Media School, Piurek leads public affairs initiatives in support of IU's academic programs and initiatives, including IU's international engagement efforts, while also managing a broad range of communications activity in support of the bicentennial strategic priorities of the IU Office of the President.